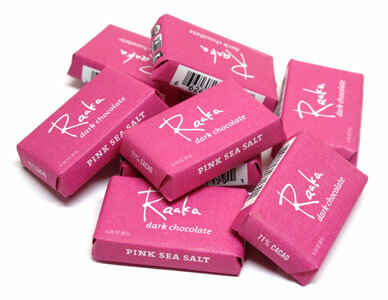 What makes Raaka Organic Virgin Chocolate Bars different from the rest? Most chocolate available today is made with roasted cacao beans. The process is considered essential to mass chocolate production, along with generous amounts of cocoa butter and vanilla. In the attempt to create a perfectly palatable and delicious "chocolate-ty" flavor sometimes the complex and unique flavors of the cacao beans are lost. Cacao beans have a greater range of flavors than "chocolate". Some don't taste "chocolate-ty" at all. Raaka takes a different approach: they make chocolate that preserves the complex and surprising flavors of the cacao beans they start with, and create an adventurous and novel chocolate tasting experience. These 71% cacao organic mini bars are Raaka's take on traditional milk chocolate, made with Dominican cacao and pure coconut for a bite-sized treat that's delightfully dairy-free and absolutely delicious. 0.28 oz. (8g) mini bars are $0.89 each.